The San Francisco Bay MarineGEO site was established in 2016 in partnership with San Francisco State University’s Estuary & Ocean Science Center (EOS Center). 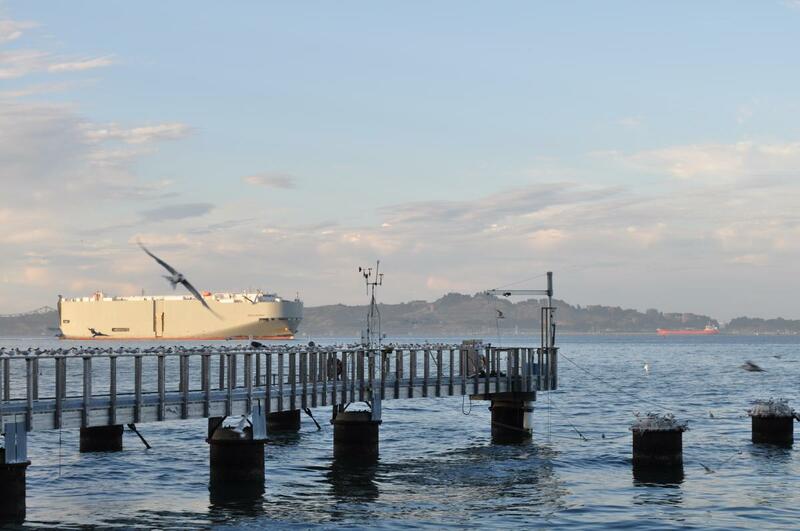 The EOS Center is located on SF Bay, the lower reach of the largest estuary on the west coast of the United States and one of the largest in North America. San Francisco Bay is linked to the Pacific Ocean through the Golden Gate. Its distinctive sub-embayments create a diversity of interconnected estuary types within a single large estuarine ecosystem. The three major sub-embayments of the lower estuary, San Pablo Bay, Central Bay and South Bay, and their connection through Suisun Bay, to the Delta create the rich habitat diversity that supports numerous marine and coastal organisms that depend on San Francisco Bay for feeding, resting and reproducing. Intertidal mudflats and subtidal shoals harbor abundant populations of marine invertebrates that nourish demersal fishes, sharks, rays and numerous wetland-dependent bird species. San Francisco Bay also has the largest eelgrass population in California. Although it is a highly urbanized estuary, it is home to over 500 species of fish and wildlife including salmon along their migratory route to inland spawning grounds, herring, anchovies, sharks and other marine fishes; crabs, oysters, mussels, clams, shrimp and other shellfish; and marine mammals including seals, sea lions, dolphins, porpoises and whales. It is a critically important stopover along the Pacific Flyway for migratory shorebirds and waterfowl. As the most invaded aquatic ecosystem on the planet, San Francisco Bay is also renowned for its high diversity of non-native species. Our initial research efforts have been centered in Richardson Bay, a sub-embayment of Central San Francisco Bay with high ecological value, extensive eelgrass meadows, as well as substantial human interaction through boating and shoreline development and use. We are characterizing the communities of natural and restored eelgrass meadows and mudflats. Annual measures include plant growth parameters, as well as assessment of animal communities on the plants and in the sediments. Investigation of nutrients and salinity across Richardson Bay, as well as tracking of rays and small sharks, is helping to establish patterns of wildlife use and human influence. The San Francisco Bay National Estuarine Research Reserve, also based at the EOS Center, maintains water quality instruments at the mouth of Richardson Bay for continuous monitoring of important estuarine water properties including salinity, oxygen, pH and temperature. Sampling of salt marshes is planned in future years. As one of the early partner sites in a temperate estuary, protocols developed for monitoring and change detection, particularly in relation to restoration activities, are intended to serve as models for long term monitoring at comparable sites as they are added to the MarineGEO network.